The January 1973's Spring-Summer collection created by Enrica San Lorenzo (Enrica Massei) for the High Fashion catwalks in Rome had been a success, as well as the shoes designed by Aldo Sacchetti to accompany the shows. Two months later, the then young designer showcased a ready-to-wear collection for the fall-winter season hosted at Florence's Palazzo Pitti, once again with Aldo Sacchetti models. 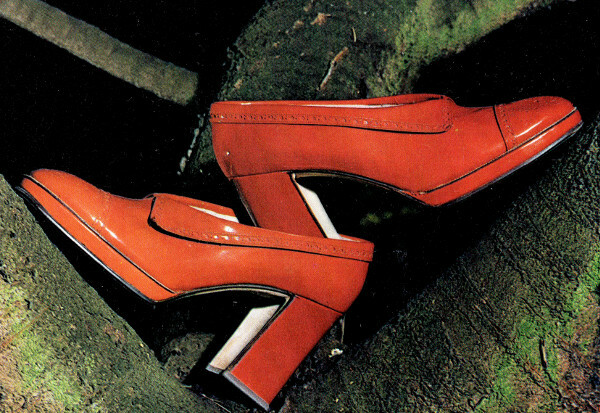 La collezione primavera-estate creata da Enrica Sanlorenzo per le sfilate dell’alta moda romana nel gennaio 1973 era stata un successo, così come le calzature create da Aldo Sacchetti per accompagnare gli abiti. A marzo l’allora giovane stilista tornò in scena con le collezioni prêt-à-porter per l’autunno-inverno, presentate a Palazzo Pitti, sempre accompagnata dai modelli di Aldo Sacchetti. Rust color, one centimeter high sole, straight and large heel. Edges turned down and English style decoration over the collar and the tip of the shoe. “The young Turin stylist is almost the only one offering, and with a careful effort, an unprecedented change in jackets and suits, balancing straight skirts and pants, shiny and wadge-shaped helmets by Maria Volpi, for a springing and finally happy image. “La giovane stilista torinese è pressoché l'unica ad averci offerto, e con accurato impegno, una variazione inedita del giaccone e del tailleur, equilibrando gonne diritte e pantaloni con i levigati, lucenti caschetti a spicchi di Maria Volpi, per un'immagine balzante e finalmente allegra. "A collection, Enrica Sanlorenzo’s, under the sign of very timely rust and its variants: carrot, orange, mango. 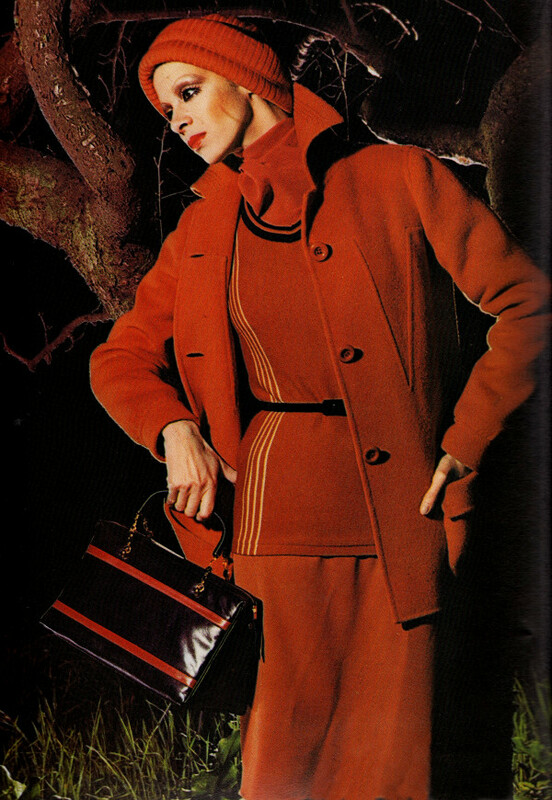 Other features are the graphic design placed asymmetrically, the belt for pulling in the waist, the little head with its cap rising out of the broad raised collar. In glazed skin these shoes with the collar-like edges turned down entirely surrounded like the toe-cap with English style perforations. They’re by Sacchetti. Coloured inserts accent the horizontal projection of the purse by Mangiameli"
While we are unfit as English teachers, it may be useful for the readers to know that when they wrote "under the sign of very timely rust and its variants: carrot, orange, mango.." they actually meant the (then) hip color rust and all its shades like carrot, orange..